Erickson and Shultz neatly encapsulate the central rationale for this collection. We aim to support and encourage educators in recognizing and ‘hearing’ pupil perspectives, and in taking them seriously as an influence on policy and practice at all levels. One major challenge of the book is thus to those who hear pupils’ voices in a spirit of interest, sympathy or amusement, but make no commitment to analysis and follow-up action. We wish to move beyond such forms of sentiment and indulgence. A second major challenge is to those who interpret childhood in purely developmental terms, for we fear that such perceptions ultimately limit our approaches to understanding what is important to pupils in relation to their experience. However, the most important challenge is to those who ignore pupil perspectives altogether. This might be said of many adults, but it is particularly important in the case of those policy-makers and politicians who strive to introduce systemic educational ‘reforms’ and extensive, centralized curricula. Our overall argument is that taking pupil perspectives seriously can contribute to the quality of school life, the raising of standards of educational achievement and understanding of many important educational issues. We would also argue the converse, that to ignore or underplay the significance of pupil perspectives can undermine the quality of school life, learning achievements and the development of understanding. Why do we want to understand pupil perspectives on their curriculum? What does each chapter teach us about pupil perspectives? How do we come to know how pupils interpret their curriculum experiences? What challenges do we face in making sense, and making use, of pupil perspectives? What is the value of listening, understanding, interpreting and taking pupil perspectives on the curriculum seriously? Why, for instance, should we be concerned about a 6-year-old’s understanding of why her teacher should want her to make a model swing? (See Parker-Rees, Chapter 2.) There are many different sorts of answers but we will focus on four, which we have called the romantic, the moral, the pragmatic and the critical. Romantic views of children and childhood are particularly embedded within the cultures of developed, western societies. They are founded on the assumption that young children are fundamentally ‘good’ and ‘innocent’. Children must thus be protected from the harsh realities of the world as ‘natural’ development takes place. Meanwhile, children carry the hopes and aspirations for the future which adults ascribe to them. This perspective yields sentimentalized views of children and might be viewed as being harmless. However, it is not. In fact, because of the way in which such indulgence presents and positions children, it undermines their status as people whose views should be taken seriously. Pupil views on curriculum may thus be collected for their naivety—‘aren’t they sweet!’. Such treatment of child perspective reflects the patronage of adults, but it does not contribute to understanding or analysis of the issues and concerns which are of importance to pupils. schools, either on an ad hoc basis or through such formally recognized programmes as that of the High/Scope compensatory pre-school programme or the use of a ‘school council’. Overall, however, the moral answer is not often articulated, and increasingly it is deemed that ‘the state knows best’ as centralized curricula are introduced. Pragmatic answers to our question may be particularly important in the context of the national priorities of modern nation states. Vinovskis (1996) characterizes systemic reform as ‘an attempt to create a more coherent, curriculumdriven reform effort’. In the case of the United States, the process was given impetus by the 1983 report of the National Commission on Excellence in Education, A Nation at Risk, which followed concern over international comparisons of standards. These concerns are now expressed through eight National Education Goals which are targeted for attainment by the year 2000. In the United Kingdom, media panics about educational standards have also been regularly deployed by the political parties to bolster their claims to provide the most effective educational change. The first English pupils to experience the entire curriculum introduced following the 1988 Education Reform Act completed their primary schooling in 1996. Annual interviews revealed clear signs of children’s increasing levels of disengagement from the curriculum as they grew older (Pollard, 1996) and their teachers were explicit about the continuing ‘overload’ of the prescribed curriculum which prevented them from responding as flexibly to pupil interests as they would have wished. And yet, it is probably true to say that, on the narrow curricular base on which measurement takes place, ‘standards’ may well have risen. However, it is arguable that there may be limits to the progress that is obtainable from systematic curriculum specification, delivery and measurement, but there may be further benefits to be fostered from tapping pupil perspectives and a renewed engagement with pupil motivation. Sadly, however, the pattern of national systemic reforms seems to produce systems that are primarily concerned with curriculum delivery and their responsive capability is generally weak. Ironically also, even when such systems are presented in terms of the creation of an educational ‘market’, with standards being raised through a process of competition between schools, pupils are not treated as even second class ‘consumers’. Our argument, then, is that not only should pupil views on curriculum be taken seriously for moral reasons, but also for the pragmatic reason that educational standards will rise further and faster if teachers are able to work with the grain of pupil motivation. The inclusion of pupil perspectives in the planning and implementation of the curriculum may thus be variously framed and we have highlighted romantic, moral and pragmatic imperatives. In a review of the literature on the subject of students’ curricular experiences by Schubert and Lopez (1994), we can find evidence of all three perspectives. The authors outline a range of historical and biographical, factual and fictional accounts of pupils’ curriculum experience.For instance, some contemporary examples include Holt’s (1982, 1983) autobiographical observations of the damaging effects in the ways we often present school subject knowledge to young children. Less factual representations include that of Granger and Granger (1986), a story-based-on-life rendering of their own child’s encounters with special education, and the anecdote of ‘teacher lore’ (Schubert and Eyres, 1992). Like the biography and autobiography with which it overlaps, the authors suggest that story does not have to be generalizable or verifiable to provide inspiration and offer new perspectives on one’s own situation. Schubert and Lopez (1994) review a wide range of qualitative research on pupils’ curricular experiences and on attempts to portray holistic understandings. Such work starts to suggest a more socially aware and critical answer to our core question, ‘Why do we want to understand pupil perspectives?’ For instance, researchers have studied the non-school curricular learning of family, peers, the media and formal and informal organizations, such as gangs (Schubert, 1986; Peshkin, 1978, 1991; Sedlak, Wheeler, Pullin and Cusick, 1986). Such studies often enhance our understanding of pupils who do not fit the mould of schooling, for instance, the drop-out (Weis, Farrar and Petrie, 1989) and the school failure (Page, 1991) and point to the need to contextualize school problems within the larger fabric of society. Extending their initial typology, the authors point to critical studies which raise questions of, ‘Who’s knowledge?’ and, ‘Who benefits?’, and emphasize the ways in which issues of, for example, race (Fine, 1991; Troyna and Hatcher, 1992), class (Willis, 1977), disability (Roaf and Bines, 1989), gender (Thorne, 1993; Davies, 1993) have a direct bearing on the accessibility of the intended curriculum and on the curriculum-as-experienced. Such studies also reveal the powerful messages of the hidden, or implicit, curriculum which reflects the values and structures of the larger society beyond the school. On the other hand, writers taking a phenomenological approach to the study of learning are primarily concerned that the direct experience, taken at face value, of the student’s own life are brought to their learning processes. A classic example of this perspective can be found in Pedagogy of the Oppressed (1970) in which Friere, through his work with Brazilian peasants, emphasized the potential of people to learn through meanings in their own lives, as an alternative to those of oppressive elites. In the light of such work, we are able to provide a further answer to our initial question. We would suggest that greater understanding of pupil perspectives would provide an important and potentially critical contribution to the ebb and flow of current educational debates. For instance, among the issues about which pupils routinely express opinions are: the relevance of the curriculum to their lives and cultures; social justice and the use of power in schools and elsewhere; and issues associated with educational opportunity. Such pupil perspectives often highlight the differences between the intended curriculum and the experienced curriculum; between what policy-makers and teachers focus on when considering the planning and delivery of curriculum tasks, and what pupils experience when engaged in such tasks. It is thus right that pupil views should be heard; it might help in the campaign to raise standards of learning attainment and we might get some critical insights into important issues of current debate. Listening to pupil voices should not be seen as a sentimental or romantic option, but as a serious contribution to educational thinking and development. Unfortunately, research studies that are concerned to engage directly with pupils’ learning experiences have been relatively few. Erickson and Shultz (1992) differentiate between those relating to the ‘manifest’, taught curriculum and those relating to the ‘hidden’ curriculum, and they suggest that issues concerned with the hidden curriculum have dominated qualitative research in schools. This reflects the predominant focus within the sociology of education on social processes and issues of social differentiation. Thus, although engagement with curriculum content and learning outcomes have featured in studies of, for instance, teachers’ and pupils’ coping strategies, socialization and peer culture, social resistance and alienation, they have generally been relatively peripheral issues. Further, even when research has been carried out, the experiences of secondary school pupils have tended to predominate. Primary and elementary school pupils experience the manifest, taught curriculum in distinctive ways, for both psychological and sociological reasons. For instance, there is a broad psychological consensus that younger pupils find it easier to engage with the curriculum when it is related to meaningful experiences, rather than being presented in disembedded and abstracted forms. From the sociological point of view, the structural conditions that affect the experiences of primary and elementary school pupils are also very particular. Thus the typical primary school arrangement of having one teacher taking a class for a year creates a particular type of social relationship between pupils and teachers which is different from those that pupils develop with secondary school specialist teachers. 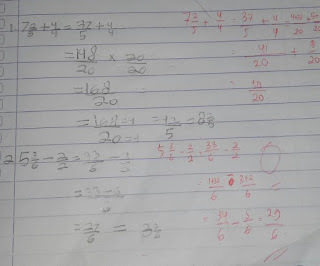 This arrangement also means that subject knowledge may also be integrated more easily, for instance, through ‘topics’. Primary schools also usually serve a relatively small community-base and home-school liaison is often close. The overall result is the promotion of school cultures in which teachers are expected to know and be responsible for the development of ‘the whole child’ and in which pupils experience a gradual transition from infancy and towards adolescence which is carefully mediated by parents and teachers. These psychological and sociological factors are reflected in the papers within this book. However, more important than the specific primary focus, is our overarching claim that serious consideration of pupil perspectives will offer new insights into the teaching-learning process. In particular, we believe that the papers highlight the weaknesses of oversimplified conceptions of curriculum ‘delivery’. What is taught is not necessarily what is learned. We begin our collection with ‘The Relevance of Creative Teaching’, which gives us a broad view of some positive pupil experiences of curriculum. Jeffrey and Woods are concerned with pupil views on the ways in which some teachers make the primary curriculum relevant to their pupils. In this chapter, pupils who experienced ‘creative teaching’ talk enthusiastically about their learning across a range of classroom activities. They describe the ways in which their teachers make emotional connections with them, engage their interest, maintain their identity and individuality and encourage their critical faculties. ‘Tale of a Task’ is concerned with a breakdown of communication between teacher and taught in the learning process. The task studied is the making of a model, from a science curriculum requirement, through teacher planning and one pupil’s experience of the task, to the teacher evaluation that followed. Unfortunately, a lack of match between intentions for learning, the task set and pupils’ experience and perception, permeated the task from conception to completion. Parker-Rees shows how meanings became distorted so that neither curriculum nor teacher intentions were realized. In ‘Shared and Negotiated Territories’, Maguire examines the perceptions and experiences of three minority language Muslim girls in a Montreal primary school. Maguire presents these children’s written texts as representations of their lived experiences and cultural stance. Their texts, she concludes, should not be understood as ‘experiential, add-on components’ in a school curriculum, but as purposeful acts of meaning with more than one evaluative context. In ‘At Least They were Laughing’, Filer, like Maguire, shows pupils working within an evaluative context that goes beyond the immediacy of the requirements of a task. The study is of the classroom talk in ‘news’ sessions in an English primary school and Filer argues that assessment procedures for such classroom talk are based on an inappropriate model of language which fails to take into account the wider context of pupil utterances and their purposes vis-à-vis an audience of peers. In ‘The Politics of Primaries’, Spaulding examines aspects of social behaviour in a class of 7-year-old elementary school pupils. She reconceptualizes behaviours frequently experienced as antagonistic by their teacher, in terms of a micropolitical understanding of their actions. Pupil explanations were sought for behaviours such as creating distractions, protesting, interrupting teachers, and showing them affection. Behaviours, which are likely to be labelled immature or egotistical, are recast as expressions of pupils’ power to influence their teacher’s intentions for their curriculum experience. Nicholls and Thorkildsen’s ‘Experience Through the Eyes of Quiet Bird’ is the story of a child with learning difficulties, who was disengaged from school tasks and relationships. At home he displayed artistic and imaginative tendencies and a critical social conscience; dimensions of his identity that he hid from those at school. Led by their tentative understandings, teacher and researcher experimented with the presentation and social organization of tasks for David. The aim was to bring David’s personal identity and academic experience into closer relationship to enhance his enthusiasm and motivation for learning. 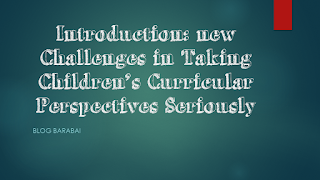 These chapters illustrate some of the insights into teaching, curriculumpresentation and learning that flow from attempts to document the direct experiences of primary school children and to take their perspectives seriously. However, the papers also engage with more methodological and philosophical questions. Thus we move from the question of ‘What can we learn?’ to consider ‘How do we come to know?’. How Do We Come to Know How Children Interpret Their Curricular Experiences? One of the reasons why young pupils’ voices do not feature in any great quantity in research into their curricular experience is because we question their conceptual and linguistic competence in addressing our research concerns. As James, Jencks and Prout (1997) point out, this questioning of pupils’ competence is embedded, usually unconsciously, in the very methodologies and techniques used to study children and childhood. Particular methodologies and techniques reflect particular assumptions and understandings of ‘the child’. For instance, she suggests that if working from an understanding of ‘the developing child’ we may assume that young children lack competencies needed to engage in the research process. Similarly, there may be problems in recognizing the breadth of relevant contexts that inform pupils’ curricular experiences. It is necessary to move beyond the formality of the classroom to consider the influence of other important social settings: the playground and school, the family and community, the media and the world beyond pupils’ immediate environment. In an attempt to address such issues, James, Jencks and Prout posit a model of ‘the social child’ and suggest that we need to use multiple methods to reflect the diverse aspects of children’s self expression. This is an issue of the form of research enquiry. For instance, the body represents one means of expression, and this has been recognized and explored in social studies of children’s games and use of space. James, Jencks and Prout suggests we might similarly explore children’s perspectives through other areas of communication that have been less well documented, for instance their art and writing, drawing, play and story. What models of childhood are we using, consciously or unconsciously? How do our assumptions translate into particular research foci and methodologies? How valid are our research designs and methodologies in understanding pupils’ experience of curriculum? The importance of such methodological reflexivity is reflected in the inclusion in the book of several chapters which can broadly be described as methodological. In ‘Observing Children on a School Playground’, Smith gives an account of his work with student teachers. He is concerned to help his students develop an appreciation of what is important to young children, physically, socially and emotionally, in their learning. As an early induction into their school experience, Smith’s students observed children at play in the playground. The point being, to learn to hold back superficial judgments, but also to avoid the assumption that they could themselves adopt children’s perspectives. The attempt was to develop ‘a watchful way of being with children’ that encourages an appreciation of ‘the uniqueness of each child at the heart of personal engagement’. Connolly in the second of our methodological chapters, ‘In Search of Authenticity’ argues that there is no one ‘true’ and definitive voice of a child. He suggests that, if we assume that young children have certain social competencies, then we must recognize that they will adapt and alter their behaviour from one social context to the next, including that of the research process. Further, in the ways we have already discussed, the voices offered through research will reflect the researchers’ own concerns and assumptions about childhood. However, Connolly is not arguing for a relativistic approach to understanding young children. Rather he is calling for a critical reflexivity in our attempts to understand their perspectives. In relation to some of his own work on racism and young children, he shows what such a reflexivity can additionally tell us about the social competencies of young pupils. Of course, all of the authors have faced these key methodological issues of assumption, context and form and their chapters illustrate attempts to access and interpret the Voices’ of pupils in a variety of ways. Jeffrey and Woods, in investigating pupils’ views of their teachers for ‘The Relevance of Creative Teaching’, found that critical evaluation of curriculum and pedagogy were an accepted part of classroom life for the pupils they studied. It came, they concluded from their teachers’ concerns to develop such faculties, to create authentic activities and to put children in ‘the engine room of knowledge creation’. Spaulding, in her study of The Politics of Primaries’, was able to draw on the experience of a group of pupils who, like those in Jeffrey and Woods’ account, were generally experienced in articulating a critique of their school experience. In Spaulding’s study, however, such experience had its origins in the socio-economic context of the pupils’ families whereby professional parents, who ‘pay for excellence and expect nothing less’, maintained a keen awareness of the school’s classroom activities. ParkerRees’s attempts to access understandings of 6-year-olds through verbal means presented him with greater difficulties. His young interviewees lacked experience of reflecting on the learning purposes behind school tasks. ‘The Tale of a Task’ offers instead a closely observed account of a task’s progress, allowing an intriguing insight into the process of one child’s attempts to complete a task to his teacher satisfaction. Both Filer and Maguire were able to draw upon an extended personal relationship between the researcher and the researched. At the point of Filer’s interviews for ‘At Least They were Laughing’, she had known the children on a weekly basis for three years. They knew, as one child put it, that ‘she won’t tell’ and discussions about the research process were a familiar backdrop to interviews and observations. Similarly, in Maguire’s three-year study of ‘Shared and Negotiated Territories’, the biliteracy development of minority language children was founded on long-term relationships with a limited number of children. The notion that pupil experience can be understood in ways other than through talk is in evidence in Maguire’s use of children’s letters, stories, and journal entries. Of all the researchers, perhaps Nicholls experienced the greatest difficulty in getting close to understanding the perspectives of a child through verbal communication. Nicholls and Thorkildsen’s account of ‘Experience Through the Eyes of Quiet Bird’ is an exploration of a child’s perspective through his responses in, among other things, artwork, writing, play, and through his acts of resistance in classroom tasks and relationships. The commitment of each author to understanding the perspectives of the young pupils they were studying permitted an openness to tapping important meanings, however they might have been expressed. Perhaps such commitment is the key factor in challenging assumptions about the nature of children and in facing the demands of research involving multiple contexts and forms of enquiry. We now have reached a point where we are ready to address some of the implications arising from the issues that we have problematized. What Challenges Do We Face in Making Sense and Making Use of Pupil Perspectives? In the final chapter, Thiessen addresses the problem of how we can make sense of, and make use of, the voices in this book and elsewhere. He urges a ‘creative application’ of research and challenges those involved in curriculum policy, design and implementation to make sense and make use of research. Thiessen suggests three levels of engagement with pupil perspectives. The process might begin with policy-makers and teachers learning about pupil perspectives from research. The idea is not that the conclusions of researchers should simply be adopted, rather that such reading may produce a reorientation of perspective on ‘what matters’ in relation to pupils’ curriculum experience. The next level of engagement would involve acting on behalf of primary pupils, taking their perspectives into full account. The real challenge here though is the problem of interpreting what is in their best interests. Engagement at the third level would involve working with primary pupils’ perspectives. An individual teacher may begin in a small way, for example in adapting the approach of Quiet Bird’s teacher towards resolving some of his difficulties. Thiessen suggests that, if present disparities between curriculum intentions and experience are to be effectively addressed, the need is for policy-makers at all levels to begin to engage with the perspectives of pupils. The collection illustrates how, when a curriculum task is presented to a class of pupils, multiplicities of experiences, intentions and contradictions will be created. The chapters address this complexity of experience and raise awareness of it for consideration in planning and implementing the curriculum. When listening to pupils, when asking them to write, when confronted by their learning difficulties, or by their seemingly immature and antagonistic responses, we need to hold that awareness and consider the underlying issues. acceptance that curriculum ownership, relevance, power and personal identification are legitimate topics for questioning and concern. These, then, are some of the themes that can be distilled from the papers. They represent signposts, pointing to key issues in understanding the subjective learning experiences of young children in school and generating questions that innovative forms of curriculum might attempt to answer. We acknowledge that there are difficulties in accessing pupils’ voices—their subjectivities are complex and diverse; their conceptual and linguistic skills may be limited; and, when pupil perspectives are researched using qualitative methods, there may be problems of representation. Could it be the case, though, that these are not the biggest hurdles to listening to primary school pupils? As the papers in this volume record, children’s voices do not necessarily reflect the view of the adults who have power over them. Given a voice, they may well criticize the dominant power structures. They may question ‘how things are’ in their worlds and provide alternative interpretations and prescriptions. Are we prepared to listen, and take these thoughts seriously? Perhaps the biggest challenge of all, then, is to question our readiness to hear pupil perspectives and to allow children a share of the sort of power we, as adults, have in their classrooms and lives. Once again though, we assert that ours is not a romantic argument, and nor do we choose to press the moral case which could be put. The grounded, pragmatic reality is that pupils’ educational attainments are likely to rise most effectively if teachers are able to leaven any necessary, systemic curricular requirements with adequate recognition of pupil experience. Effective teaching must recognize the concerns, interests and motivations of learners. It is not a delivery system. 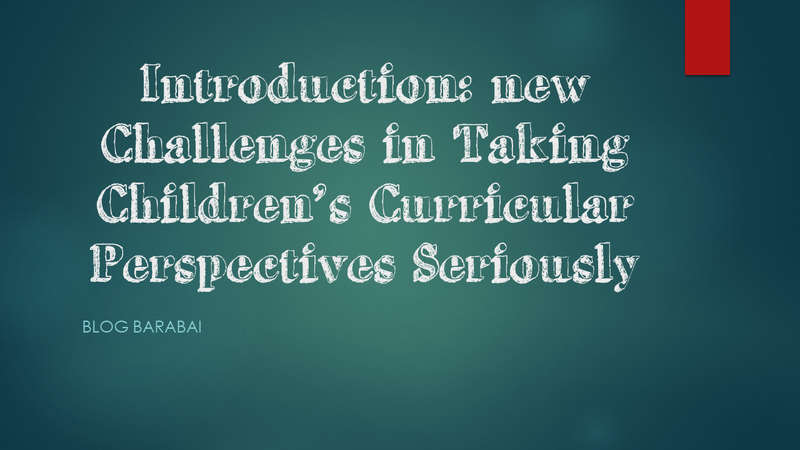 0 Response to "Introduction: new Challenges in Taking Children’s Curricular Perspectives Seriously"